Questioning authority. Thinking independently. Not accepting things at face value. These themes are found in punk rock music, which Jason Torres (B.A. ’07) began listening to in high school. Little did he know that his interest in the genre would, in some ways, later inspire his future in science. Now a graduate researcher at the University of Chicago, Torres studies the genetics of Type 2 diabetes. By December 2015, he will have earned a Ph.D. for his work on mapping expression quantitative trait loci (eQTLs) in human fat and muscle, which accounts for much of the genetic risk to get Type 2 diabetes, he said. By better understanding how much eQTLs contribute as a risk factor for diabetes, Torres hopes that his research could lead to better therapies and improved patient outcomes. So where does punk rock fit in here? Part of being a scientist, Torres believes, is being able to ask questions, rejecting the status quo and thinking outside the box – much like a musician. “The process of uncovering new knowledge is not clear and there is no one path to achieving a scientific breakthrough,” he said. Exploring the genetic architecture of Type 2 diabetes is not an easy path, he noted. 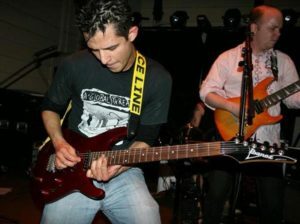 Torres credited his four years at St. Mary’s University and his time playing in a punk rock band called Insurgent – formed at the start of the Iraq War – with helping him “cultivate aspects of critical thinking.” On his free time, he still performs in a band at different venues across Chicago. He hasn’t quite had a scientific “aha moment” while shredding guitar chords for fun, but he said time off from spending long nights in the lab helps him come back to work refreshed and with new ideas. Once he gets his Ph.D., Torres said he’ll dedicate his post-doctoral life to further understanding Type 2 diabetes, but there’s something else he wants to do first: return to his rock roots. “I want to take a month off, get my friends together (from Insurgent) and do some serious recording in the studio,” he said.